Yes, it may seem a bit odd for me to be planning out the master bedroom when I have a nursery to work on (ceiling is painted! Squeal!!!). Keep in mind that now is the perfect time to get the house cleaned up and ship shape before baby arrives. Once baby is here, it will take us a while to tackle these rooms. 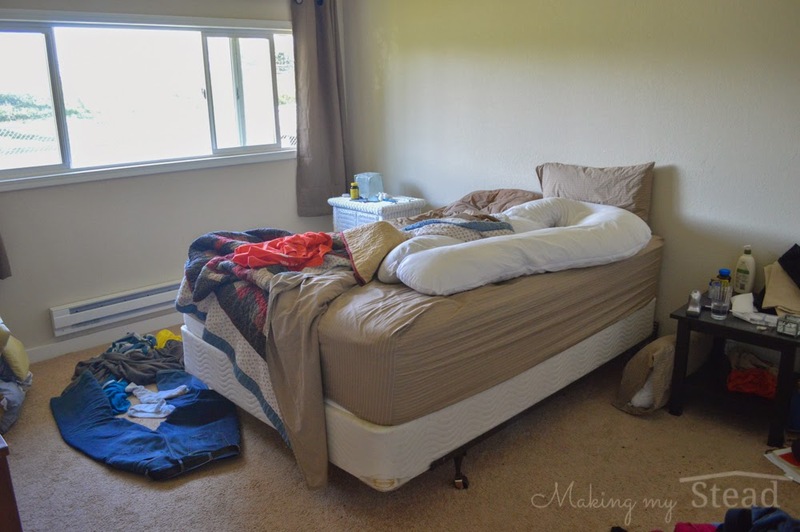 The master bedroom and guest room/office are two rooms that are in desperate need of attention right now. We need to get the guest room ready for when my stepson is in town (this Summer; he will be here for when baby is born!). We will have a bassinet in the master bedroom for at least 6 months. Currently the master bedroom is a wreck. And I mean a WRECK!!! What our bed looks like on a daily basis... See my maternity body pillow? It's a life saver! We have a mountain of clean clothes in a pile in this wicker trunk with a comforter from this winter on top. My dresser is old and worn out. I have had it since I was 12 years old. Can you see how it is sagging in the middle and the drawers don't quite close? We have dirty clothes overflowing the laundry basket and in a pile in front of the closet. 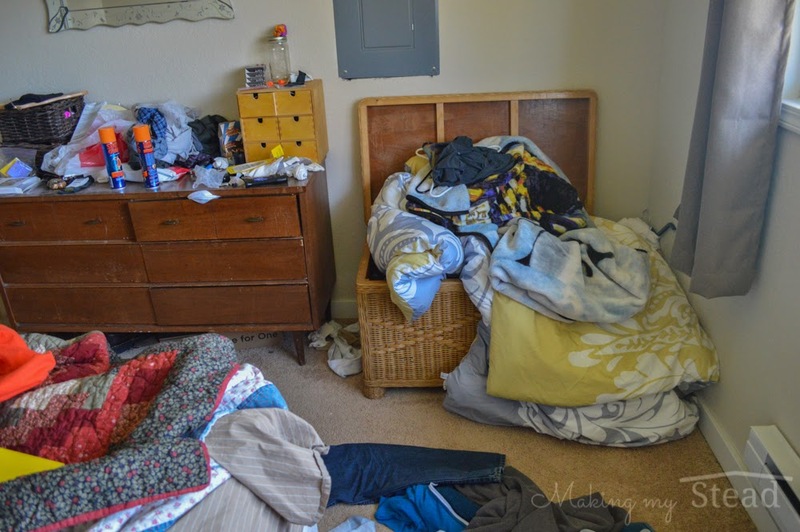 The closet has junk and unused bedding all over the floor. Plus I HATE our closet doors. The closet will forever be half closed. There isn't a light in there, so it is always dark and hard to pick out clothes. 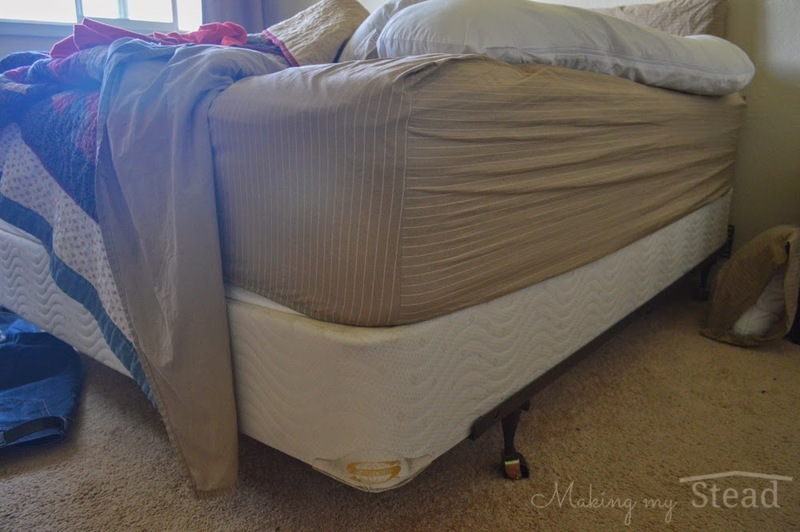 Our ugly bed is on an uncover box spring with a metal rail frame. Our bed is a mattress/boxspring combo on the original railing I got with the mattress set. We HATE the railing. For one, it is on wheels and moves around. Two, it is partially broken. And three, this bed is just uhhh-gly! Soooooo… In order to get the bedroom ready for when we have an infant sharing this room with us, I decided to get inspired. I want to not only clean it up, but make it a room I actually like to be in. 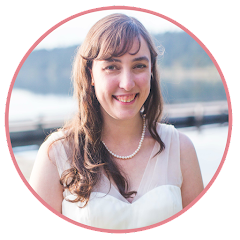 Here is my inspiration (task) list for making my bedroom a welcoming place for us. Years ago, in a galaxy far, far away... I thought I would make us a bed using plans from ana-white.com (I love her farmhouse bed! ), but that just hasn't happened yet. I feel like I am running out of time and getting too big to do any woodworking projects. This upholstered box spring bed looks like it could be completed in a few hours and I think it looks sharp. I like that this tutorial by Momma Rake requires no sewing. She stapled the fabric on with a very nice looking pleat at the corners. The legs (and optional hardware for attaching them) can be purchased from a home improvement store. I really want a nice headboard. Currently the white walls are getting somewhat stained where our pillows rest. I don't know how or what this is, but it annoys me. I have seen many tutorials on how to make your own wood headboard. 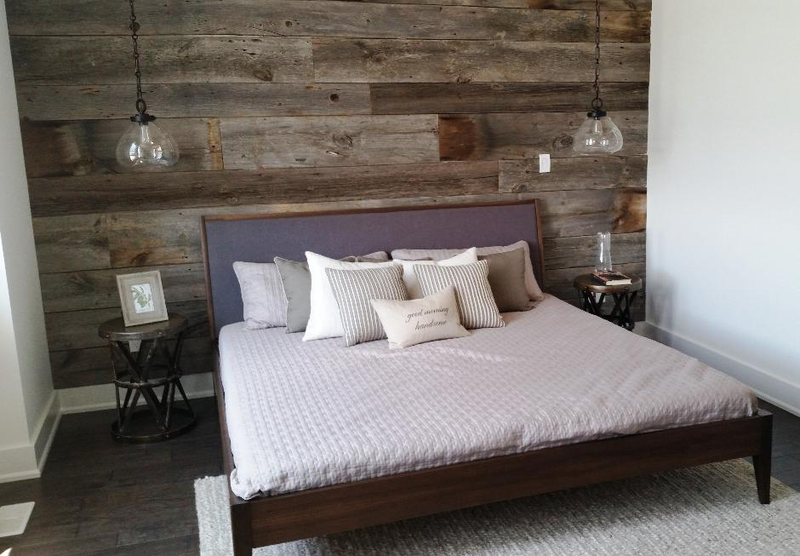 Ana White has a reclaimed-wood look headboard that is beautiful! 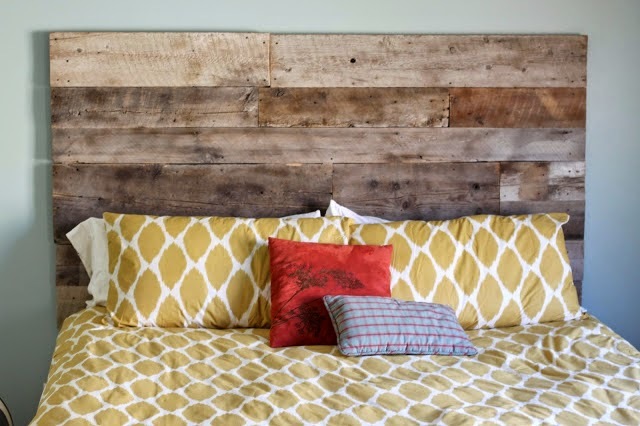 I have also seen a pallet headboard (by The Thinking Closet) tutorial and a tutorial where they create a plank headboard (by Boxy Colonial) by screwing the planks to the wall. Once I started looking at plank headboards, I started looking at plank walls. I love how this creates an interesting look and feel for the whole room! Instead of screwing actual wood to the walls, I have been considering stick-on wood/vinyl/tile flooring as an option. I've seen several people create a planked wall from these stick-on wood flooring. I like the look of creating a headboard on the wall, but I also really like the look of doing the whole wall behind the bed. I think it would look very sharp in our room. Of course, once I did the whole wall I would then start thinking about a headboard again to finish the look. An upholstered headboard is out of the question (remember the stains on the walls? I don't want stains on the fabric either). Our current mismatched beside dressers are horrendous. I love the idea of these 3 drawer dressers, because it will also give us more storage that we desperately need. I could see keeping my kindle and/or a book, my vitamins, tissue, chapstick and lotion in the top drawer. My pajamas that I am currently wearing in the second drawer (during the day, so they aren't thrown on the floor or under my current bedside table). Pants/bras that have been worn once, but aren't dirty yet, could go in the bottom drawer. I could see my husband storing random stuff in his top drawer: static guard, deodorant, vitamins, the contents of his pockets during laundry day, etc. Maybe some hoodies in either the bottom or middle drawer. Whatever else he likes to keep in the bedroom. I would love to refinish our current dresser by painting it gray and changing out the knobs. I have a feeling that it isn't worth it though. It seems to be sagging in the middle and the drawers are stiff to open and close. Part of me would love to look for a good, solid wood dresser from goodwill. 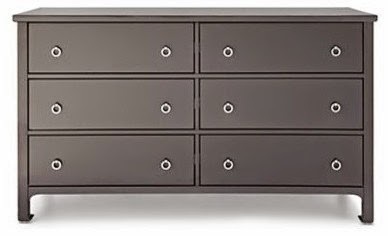 Another part of me would like to settle for a HEMNES 8 Drawer Dresser from Ikea, which wouldn't be a bad option for now. I could always give the Ikea dresser to one of the kids and invest in a nicer dresser for us later down the road. Ever since we moved in, I have HATED our master bedroom closet. Yes, it is nice and big compared to the smaller bedrooms. It's almost a walk in closet. I should love it. BUT, the doors are horrendous and there is no lighting inside the closet. I want to remove the closet doors and replace them with a curtain. 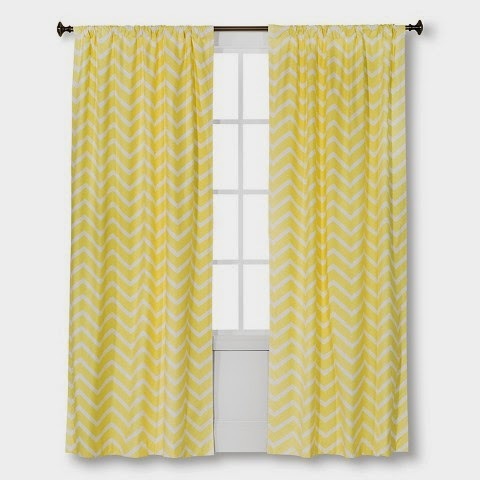 Perhaps something yellow like these curtains. That way the curtains could hang on either side of the door frame, out of the way when you want access to clothes. But if you want to give the room a nice, tidy appearance for company, simply close the curtains. The curtains could also add a nice pop of color to an otherwise plain room. 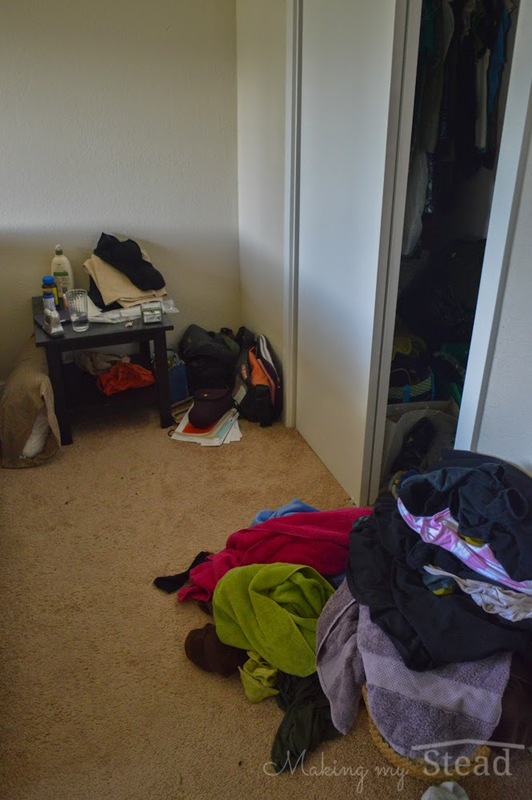 Once the closet is more accessible (and I have thoroughly cleaned and emptied it), I want to make it more functional. I want to get rid of our current laundry basket and opt for twin (or maybe three?) laundry baskets that are inside the closet. A his and hers baskets. Perhaps these cheap ones from Ikea would do the trick. Last, but not least, I want to hang up some wall art opposite of our bed. I want two canvas’ that are identical in size to go on either side of the dresser. One will hang over an unsightly electrical panel (did you catch a glimpse of it above the wicker basket?). 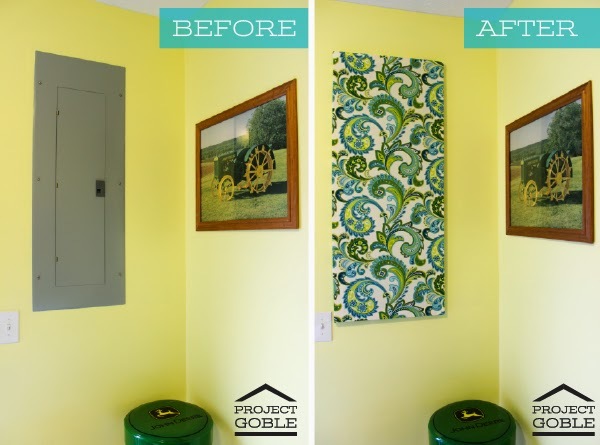 I saw this tutorial on making wall art for this exact purpose. 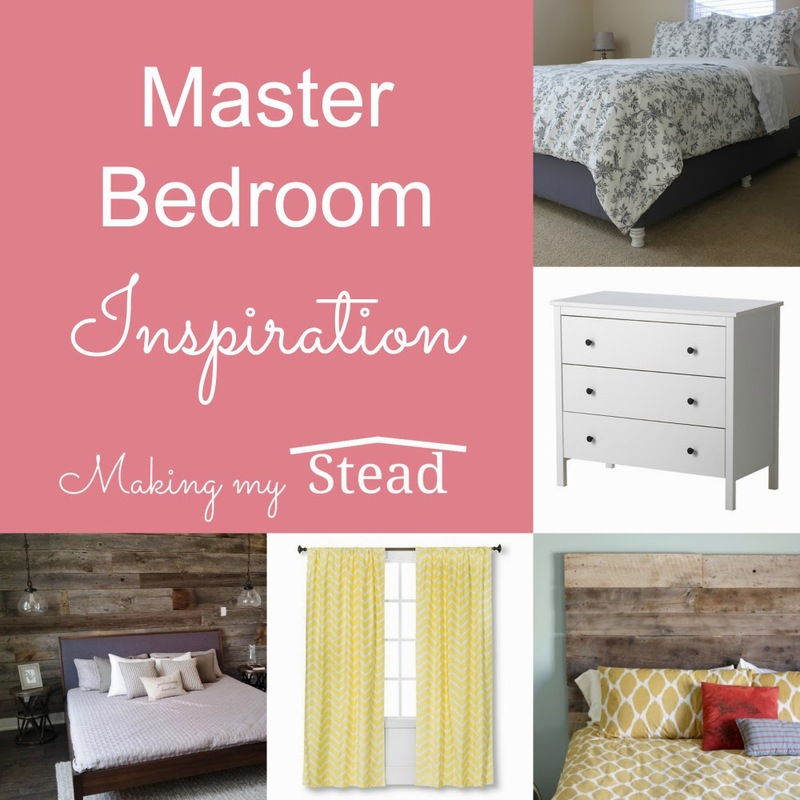 What do you think of my master bedroom inspiration? Honestly, anything would be better than what we have now. I find our bedroom so cluttered and unsymmetrical and just plain ugly right now. I want to give it more color and texture and cleanliness. I'll keep you posted if and when I get this accomplished. Wish me luck! I love your plans for the bedroom. Hopefully you can get it all finished before the big day! Back in March, the Breeders Cup 2018 Live Stream switch steed named Gronkowski offered an uncommon open door for Thoroughbred hustling to make a mark in the U.S. wearing cognizance when he won a Kentucky Derby qualifying race at Kempton Park in England. Proprietor Phoenix Thoroughbred III rapidly exploited: Gronkowski the human purchased an offer of the steed and promised to go to the Derby to watch his namesake run, and he posted about the three-year-old foal on his online life accounts. "We try to encourage [staff] not to be too authoritarian ... Melbourne Cup 2018 Live Stream I think if you take that light hearted approach, [the patrons] seem to enjoy it and it's an effortless thing going through the station." When the Cup is on, Mr Panoussis is busy preparing for the return of thousands of racegoers from Flemington, so how does he find out who won?